Sun lovers seeking a touch of paradise will feel right at home in our 2 holiday houses on the outskirts of Lovina (North Bali), situated just 300 metres from the beach. 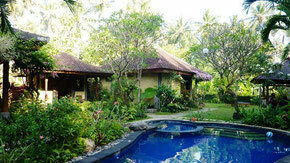 The bungalows are surrounded by a well-tended garden, high bamboo and coconut palms as far as the eye can see. There are also a football pitch, fisherman´s village and rice fields close by, providing you with a real mixture of nature with exotic animals and asian village life. The larger bungalow has two spacious bedrooms, a large bathroom and a veranda overlooking the garden. 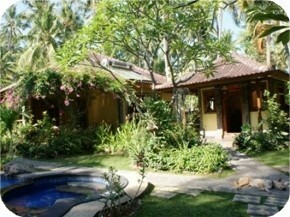 The smaller bungalow has one bedroom, a nice bathroom and a veranda in a secluded corner of the garden. 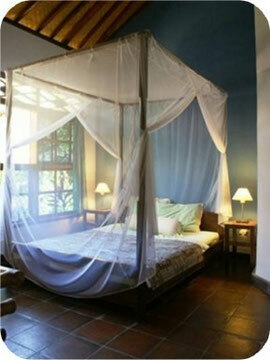 All bedrooms have double beds with mosquito nets and large ceiling ventilators. The bathrooms have showers with hot water. There is a kitchen (separate building) between the bungalows with a fridge and a cooker. Whatever is required for breakfast as well as drinking water, coffee and tea for the whole day will be provided and is included in the price. We organize airport pickup, trips to places of interest in Bali, snorkelling, diving, dolphin watching and other holiday activities. 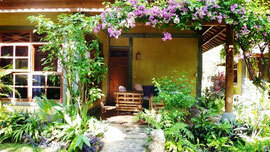 If you are interested in tradtional Balinese dancing evenings or cooking courses - we know the best addresses. Enjoy a refreshing dip in our pool or just relax in our garden pavillion where you can enjoy a massage. 300m from your bungalow you reach the street "Jalan Laviana" (= "Jalan Pantai Banyualit") with Hotels, small accommodations, restaurants, warungs, bars and shops. Money changers und diving centres are also situated quite close by on the main street towards the Lovina centre. If you would rather eat "at home", we can order you something from restaurants outside. Or take advantage of the pick-up service of another restaurant (with original Balinese cuisine), which brings you back "home" reliably.